In 1951 a committee, initially known as the Provisional Intergovernmental Committee for the Movement of Migrants from Europe (PICMME), was formed to attempt to deal with the chaos of the displacement of millions of people as a result of World War II. Its purpose was to assist European governments identify countries for the potential re-settlement of some 11 million people uprooted from war-torn countries. During the 1950's it managed to re-settle over a million people - an incredible achievement in my view. The committee has undergone several name changes over the years. In 1952 it became the Intergovernmental Committee for European Migration (ICEM). In 1980 to the Intergovernmental Committee for Migration (ICM). Then in 1989 it changed to the International Organization for Migration (IOM). The IOM also deals with the resettlement of people displaced by natural disasters. Click HERE for more on this great organisation. 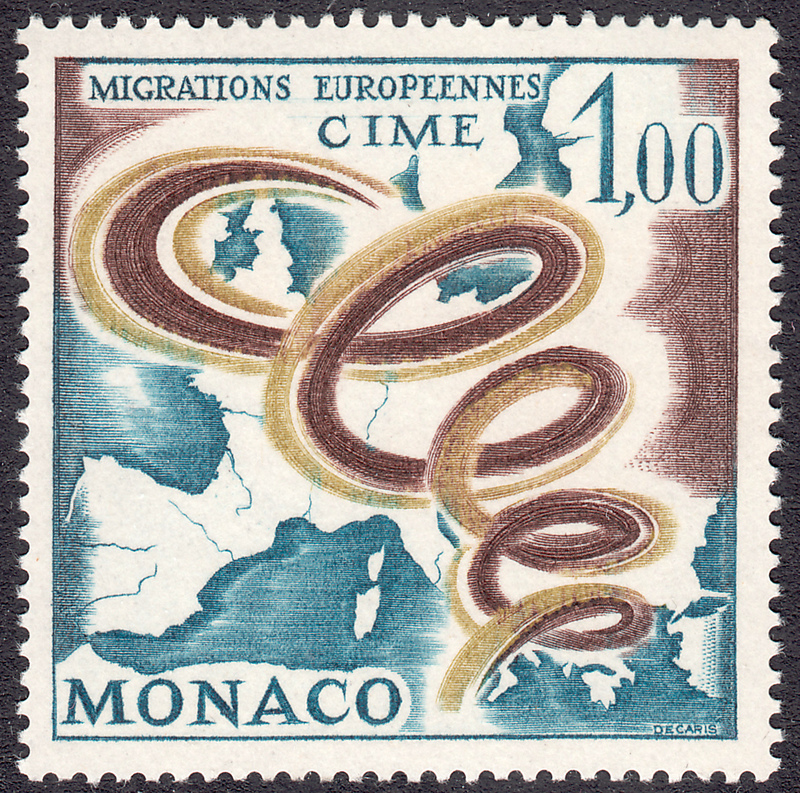 On 28 April 1967 Monaco issued a stamp to publicise the Intergovernmental Committee for European Migration (ICEM), which on the stamp uses the acronym CIME. This stamp was engraved by Albert Decaris. As far as design goes, this stamp is excellent. The graphics are simple, elegant, and speak volumes. The spirals suggest controlled, successful migration - to me at least.